Red drawfs tend to have fluctuations in their output that cause issues for a potentially habitable planet. Intense radiation from a star can basically blast the atmosphere off a planet. It is suspected that this is what happened to mars, and that the earths magnetic field (gifted to us by the metallic core) is what has allowed the earth to retain atmosphere for this long. It's likely that a magnetic field is a precursor to an environment stable enough to develop life. 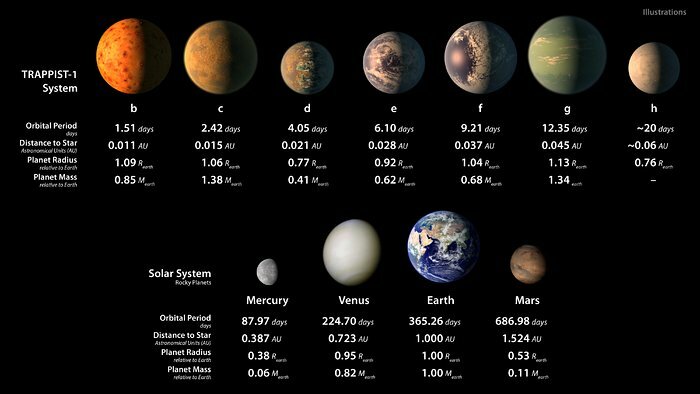 TRAPPIST-1, which lies 40 ly from Earth, is an interesting system. Even if there were no life possible there, the views would be spectacular with so many Earth and near-Earth sized planets in such tightly packed orbits. 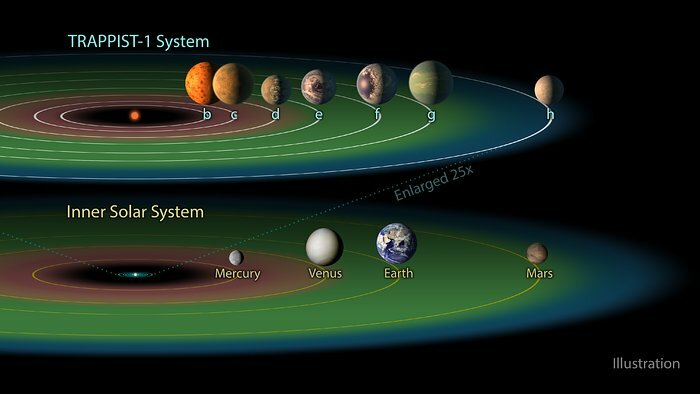 Trappist-1c is about 50% further from d than Earth is from the Moon. d is 3 Earth-Moon distances from c, likewise from e to d, there are four Earth-Moon distances between e and f, and f and g.
Getting back to the original topic, it seems to me most any ship capable of a trip duration that we would consider survivable time frame would basically be a weapon. Even accelerating a modest mass, say 1000-3000 tons, at 0.01g consistently would add about 1%c per year and give you impact measured in gigatons at the arrival point in only a half dozen light years. A probe specifically designed to gravity assist rather than slow down so as to investigate multiple star systems would be indistinguishable from a weapon designed to devastate a biosphere. Assuming 0.06c and a mass of 3000 tons, that's 105 gigatons. Last edited by Ironduke; 06 Apr 19, at 17:41. The three evoluntionary break throughs that created us were fire, tools and dogs. Man before dogs is just a member of our family tree, man after dogs is us. Ever wonder why we like puppies, why babies like stuffed animals, why dogs are so attuned to us? We evolved together. I've also been of this opinion for several years. The way I see it, humans progressed over the last 15,000 years or so from: hunter-gatherers > herders/pastoralists > farmers, to what we have today. Herding and pastoralism was the transitional step between hunting and gathering and forming settled, sedentary agricultural communities. Dogs are necessary to herd and guard livestock, especially in an environment which was much more wild and dangerous back then, before man so thoroughly mastered and transformed the natural environment. Without dogs, we wouldn't have made the leap from hunter-gatherers to what we call civilization. No agricultural surplus to support cities, artisans, philosophers, or scientists. No written language, electricity, Space Shuttles, or skyscrapers. We'd still just be hunter-gatherers with stone tools and fire. Some pictures showing the size, positions, with some liberties taken for artists' impressions. 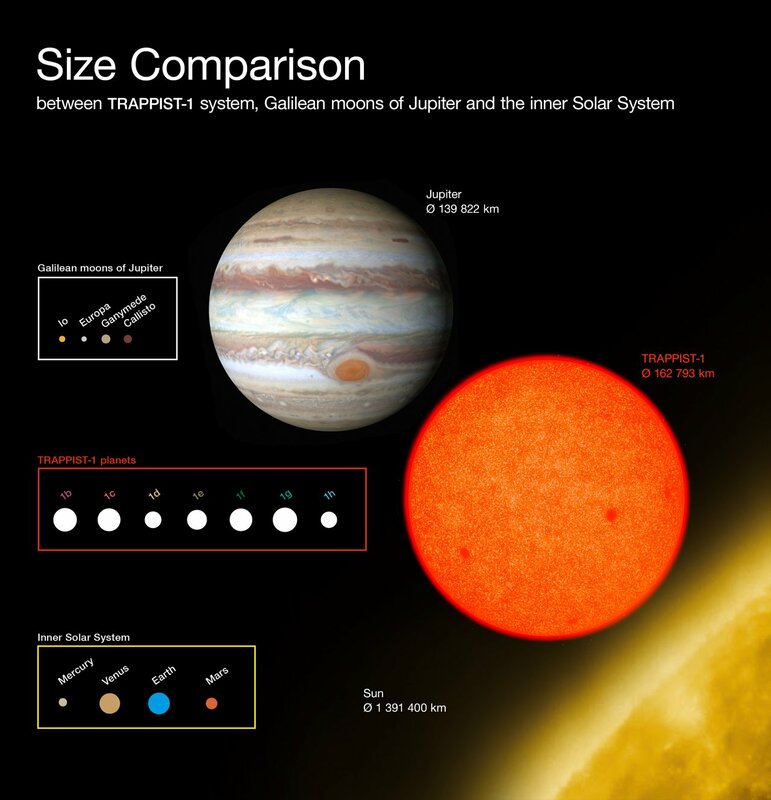 Illustrations from ESA/Hubble and NASA. Considering that any war requiring you to fire off relativistic KKVs using space stations would drag for years on end due to the sheer distances involved in space travel and hence the amount of time it takes to actually get to the battlefield, this may even be a decent way to deal a blow to enemy forces before you arrive. Think of it as an interplanetary or even interstellar ICBM with a warhead that’s a solid piece of something heavy and dense. But how are you going to guide it? How will you make that the tiniest of rounding error in your calculations magnified by trillions of miles causes it to miss the target? But this may actually be a secondary concern since there’s no way your RKV will even reach the target without some sort of anti-friction force field. True, the interstellar medium is sparse, but flying through it at 0.99c is no easy task and ordinarily insignificant impacts with a stray particle here or there come very quick and add up to some very significant friction that can push the relativistic KKV off course. When it actually approaches a target in a solar system, friction with the much denser planetary medium would vaporize anything traveling over 0.1c so your KKV would be sandblasted away in an instant. It would be like firing a bullet only to watch it vanish into thin air with a bright flash, never hitting your opponent. If you’re perched somewhere in the Oort Cloud and set your sights on Earth, the relativistic round would vaporize around on the outer reaches of the Kupier Belt. Last edited by Ironduke; 14 Apr 19, at 23:04.